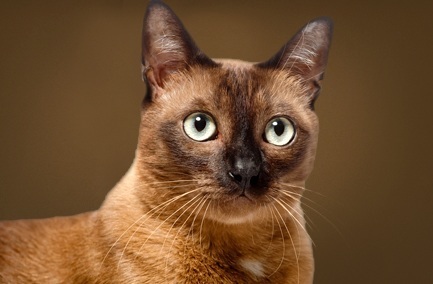 The overall impression of the ideal Burmese would be a cat of medium size with substantial bone structure, good muscular development and a surprising weight for its size. This together with a rounded head, expressive eyes and a sweet expression presents a totally distinctive cat which is comparable to no other breed. Perfect physical condition, with excellent muscle tone. Coat colours: Sable, Champagne, Blue and Platinum.